Canada is a fully committed partner, working with the U.S. to promote peace and security around the world. Canada has fought alongside the U.S. in defence of our common values through World Wars I and II, the Cold War, Korea, Balkans, the Middle East, and Afghanistan. 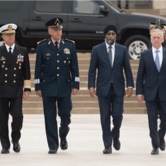 In fact, Canadian Army, Navy, and Air Force officers are embedded throughout the U.S. military at all levels – protecting and defending our shared continent in search and rescue operations, interdiction of illegal narcotics, and humanitarian assistance and disaster relief missions. 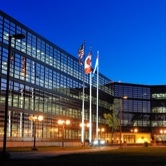 For the last sixty years, members of Canadian and American armed forces have jointly defended North America at the bi-national North American Aerospace Defence Command (NORAD). Throughout its history, NORAD has stood ready to respond to threats from intercontinental ballistic missiles; terrorism; and other air, missile, and space attacks. Canada’s recent commitment to increase defence spending by 70% will provide increased capability to support global operations, including peace support operations. Canadian troops ensure that Canada is strong at home, secure in North America, and engaged in the world. Canada’s recent commitment to increase defence spending by 70% will provide increased capability to support global operations, including peace support operations. With ongoing investments in space, cyberspace, intelligence, R&D, as well as force modernization, Canada is continuing to innovate. What’s more, Canadian Armed Forces (CAF) are active throughout Eastern Europe, and are leading NATO’s multinational battlegroup in Latvia. 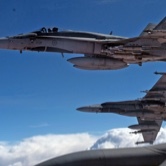 In the fight against ISIS, Canada is part of the NATO mission in IRAQ and is a vital participant in INHERENT RESOLVE – conducting air operations, mentoring the Iraqi security forces, and assisting with regional capacity-building. CAF ships and aircraft are working with the U.S. to enforce UN Security Council sanctions against North Korea. They are also deployed across North Africa, most notably in Mali as part of the UN’s peacekeeping mission. 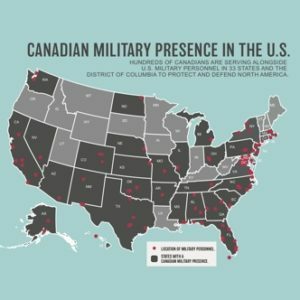 Canadian Military Presence In the U.S.